Orthodox Societies: May You Proclaim Your Glory In The Midst Of My Sufferings! May You Proclaim Your Glory In The Midst Of My Sufferings! In The Midst Of My Sufferings! Lord grant me with Daniel the spirit of praying and fasting with humility. Let me find in You my peace and the joy of my heart. Let me not ask for a delicious food. For I raise the voice of my cries to the throne of Your grace! Often I think that you have forgotten me and that You do not hear my prayers and groaning. Open my eyes so that I may see You working for my sake. You hide temporarily Your works from me. So that I may have a dialogue with You! I fell down and I am scared. O Holy One, let Your hand touch me. Let me hear Your voice full of hope telling me to "Be of good courage." Your words have dominion over my inner depths! I see the world attacking the truth and persecuting Your church. 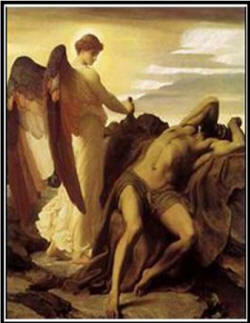 I see Gabriel the Archangel working with Michael the Archangel to defend Your church and Your people! You gave free will to the evil people, but due to Your great love. You sent the heavenly host to protect us. You are amazing in Your justice as well as in Your love. Declare Your glory amidst Your sufferings!